Happy Friday y’all! Just popping in to give you a sneak peek of a project I’ve been working on this week. I still have more photos to snap before I can share the finished result, but this little pop of pizzaz has been making me smile. I used spray adhesive to attach the paper to the drawer. It only took a couple minutes and adds an unexpected flair to an otherwise ordinary drawer. This would be perfect in a kid's room! Thanks for sharing. This post came at the perfect time! I was trying to figure out paper for a big project and you've definitely inspired me! Super cute and very fun!! I love this!!! You are so clever!! 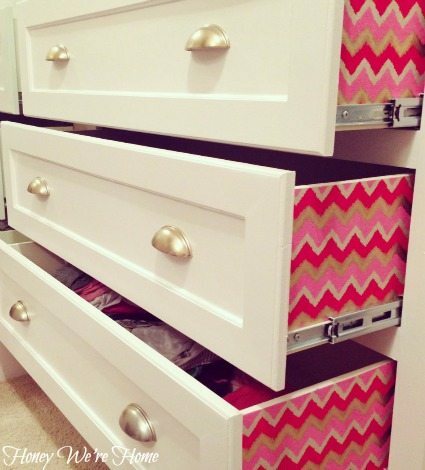 Aww what a fun way to spruce up your drawers! Great idea. That is so cute! I love bright, colorful and fun and this certainly fit the bill! Great idea! Love it! I am in the process of adding a bright aqua to the interior and sides of all of my kitchen drawers! The surprise just makes me happy! Can't wait to see the finished project. Love the paper you chose! Love this! What a great idea…love reading your blog! Super fun! Have a great weekend! So amazing! A simple task but the outcome is so impactful! I will definitely need to try it some day. Thanks for the inspiration! So cute! Can't wait to see the whole shebang.